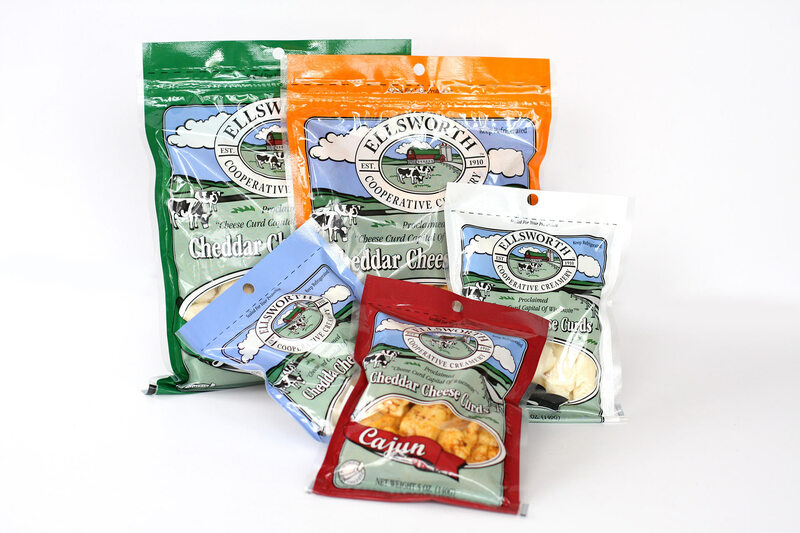 From the Cheese Curd Capital of Wisconsin, Ellsworth Cooperative Creamery Natural White Cheddar Cheese Curds taste like no other because they are crafted with only rBST free milk from our 450 family farms throughout Wisconsin and Minnesota. Our unique packaging process produces the freshest tasting curds, tested to have a shelf life that exceeds 6 months when kept refrigerated and unopened. The oxygen is taken out of the bags – yet the cheese remains loosely packaged. The longer the cheese remains inside the sealed/unopened package the more enriched the cheddar flavor becomes. The health-conscious consumer will appreciate they are crafted using the highest quality farm certified rBST free milk. They are also high in calcium and protein, contain no added sugars, no carbs, zero trans fats, and are gluten-free. Pasteurized milk, cheese cultures, salt, enzymes, Natamycin (natural preservative), Salt, Maltodextrin (From Corn), Buttermilk Powder, Garlic Powder, Yeast Extract, Parsley, Silicon Dioxide (Anti-Caking Agent), Xanthan Gum, Chives, Spices, Onion Powder, Disodium Inosinate and Disodium Guanylate, Malic Acid. Pasteurized milk, cheese cultures, salt, enzymes, Natamycin (natural preservative), granulated garlic. Pasteurized milk, cheese cultures, salt, enzymes, spices, dried hot sauce (red peppers, vinegar, salt, garlic), dried tomato, natural butter flavor, maltodextrin, encapsulated onion (dextrose, natural onion flavor), less than 2% potassium sorbate (preservative), Natamycin (natural preservative). Pasteurized Milk, Cheese Culture, Salt, Enzymes, Natamycin (Natural Preservative), Onion* & Garlic*, Chili Pepper & Other Spices, Salt, Dextrose, Paprika, Whey*, Oleoresin Paprika, Less Than 2% Silicon Dioxide (Prevents Caking). *Dried. Pasteurized milk, cheese cultures, salt, enzymes, Natamycin (natural preservative), Cajun seasoning (dehydrated garlic, spices, salt, paprika (color), red pepper, dehydrated onion).